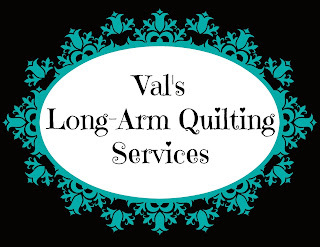 Val's Quilting Studio : WIN Batting This Summer!!! This batting is twin size and measures 72"x 90". As a teacher, Summer is my quilting season and this year I have no plans but to be home. Annnndddd, I'd love to quilt for you! Here's the deal: with every quilt top you send to me to be quilted using an edge to edge pantograph, you will be entered to win the above batting. This cute cat quilt was sent by Nancy who blogs at PugMom Quilts. This one is for a five year old little girl and I was thrilled to have found this whimsical pantograph to finish this quilt for her. How would you quilt a Civil War Dear Jane top ?????? A light, open pattern. I'll email you some examples. That is such a cute cat pattern. It is so much fun.. Happy summer Val! I hope you get lots of quilts to finish for people while you have the time.